Have you created the perfect patio: cosy and private, perfect for hosting drinks parties for friends or for curling up with book in a comfy chair on your own? They also give green-fingered urban dwellers an opportunity to indulge their passion for container gardening and planting out a kitchen garden. Whatever your plans for your summer patio, follow this guide for patio design ideas and inspiration. Evoking memories of happy trips to warmer climes with brightly coloured accessories is a simple way to make a staycation feel like a treat. For a small patio, choose a bistro set and surround it with exotic planting in pots to create an intimate, private retreat. We love this pretty Mosaic Bistro Set from Dunelm, which adds a splash of colour to the garden, even on dull days. If your patio is overlooked and on the small side, low seating will not only make it feel larger (plus you'll be able to see over it from inside to the garden beyond), it will also help improve privacy in your garden. Create an exotic theme with printed cushions, patterned throws, and these Graham & Green leather Moroccan pouffes (see below), which look just as good inside as out. And why not serve up refreshing mint tea to really immerse yourself in a Moroccan summer fantasy? A full tea set complete with an intricate tray is available at Amazon. Buying patio furniture and accessories that you can leave out year-round is a must if you don't have the shed storage space. So, shop for teak (whether new or reclaimed), which is the most durable of all garden furniture timbers, and match it with water-resistant accessories that don't mind the odd shower or two. If you're clever, you might even match durability with creating an eco-friendly garden, too. Bridgman offer a wide range of teak, while the graphic, patterned Otis Navy rug from Dash & Albert is not only stylish, but also environmentally friendly: it's made from recycled plastic bottles. Available at Snug Interiors. If you like to dine al fresco, but are still living with the same garden table you bought years ago (and failed to maintain as you swore to), a pretty tablecloth and matching chair cushions are must-haves. This bird-patterned tablecloth from Pignut comes with matching napkins. You don't need a lot of stuff to create a perfect atmosphere for summer lounging. An understated, well-built set will be more than enough for most patios, especially those on the smaller side. Recreate the look shown here – and discover more patio ideas on a budget – at Argos. Balcony patios tend to be the smallest, and substantial rattan furniture sets may not be an option (think dragging heavy furniture upstairs!) 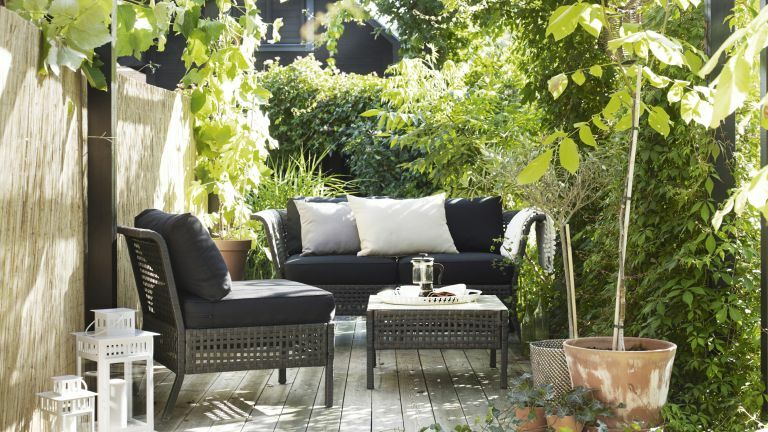 Opt for a lightweight but stylish solution, such as this very affordable one from Ikea, who have plenty of brilliant small patio ideas. Container gardening is one of the joys that come with having a patio, and is relatively easy, requiring little more than regular watering, assuming you choose low maintenance plants. Hydrangea and geranium do well in containers and provide lots of stunning colour; or, you can choose exotic species, such as palms, citrus or olive trees, although they will have to be brought inside during cold spells. Citrus trees and Hydrangea ‘Black Diamonds Shining Angel Blue (pictured below) are available at Thompson & Morgan; potted olive and palm trees can be purchased at The Palm Centre. Add an instant splash of colour, without sacrificing comfort, with a woven rattan chair. We love this multi-coloured one from Habitat: it is generously sized and ergonomically shaped, and its dazzling bright colours are guaranteed to liven up your patio. You can also create your own colourful garden chairs by painting them – a DIY patio idea even a beginner can tackle. Shop tableware, garden furniture and lounging sets in durable natural or man-made materials, with steel frames (which can stand up to the weather and are light enough to move about easily), and with deep seats you can lean right back in. Cushioning is important, too: it needs to be as deep as your sofa's, but shower- and mould-resistant. We love this roomy and inviting rattan range from Ikea. Lunchtime summer sun can get overwhelming - even in Britain! So, create a shady corner – and a splash of colour and pattern – with a stylish parasol. Got a spacious patio? A freestanding parasol will give you plenty of coverage. No room to swing a cat? A clever, clamp on parasol will be perfect. We like the Clamp-on William Morris Parasol from JD Williams (below). For some of us, the outdoor area is more of a retreat. For a chance to have some time all to yourself, and away from neighbours’ eyes, opt for an arbour seat. We like the Rowlinson Tenbury Arbour Seat from Cuckooland. If your patio has a bit of extra space – and you are a sun worshipper – why not invest in comfortable rattan loungers? We like the Valentine Rattan Sun Lounger in Pure from Cuckooland. Ditch style-free patio heaters in favour of the most natural heat source there is: fire. Cheaper to run than a heater, guaranteed to keep you warm, and perfect for conjuring up a convivial atmosphere, a fire pit is a stylish companion to patio lounging on those days when summer temperatures aren't their best – or you stay out too long. Our pick is the Ibbi fire bowl. Hanging seats are the ultimate patio lounging luxury. There is something infinitely relaxing about gently swinging in a seat that is one step away from becoming a hammock. Put yours in a shady spot. We think that the romantic Macrame Double Hanging Seat from Ella James is just perfect for a summer afternoon nap. A patio does not have to have lots of accessories to be beautiful. If you prefer a streamlined style, consider investing in sleek, elegant furniture that will give your patio a contemporary feel – just don't sacrifice looks for comfort. Metal and wood can both be unforgiving without chair cushions; man-made materials are often more comfortable. Whatever you buy, ensure its material is fade-proof as well as weather-resistant. Our pick is the very elegant Weave range from Point, available at Go Modern.